Throughout this article series, my goal has been to explain how to perform the most basic and common configuration tasks using Windows Server 2012. In this article, I plan to wrap up the series by walking you through a few more techniques. In the previous article I walked you through the process of installing roles and features onto Windows Server 2012. I want to wrap up this series by showing you what to do after the roles and features have been installed. 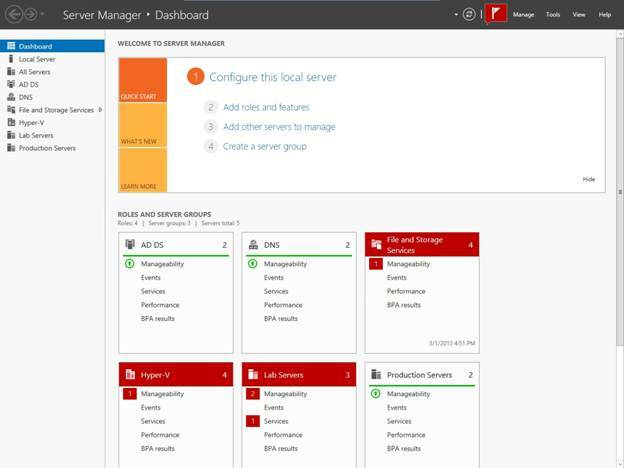 If you look at Figure A, you will see the Server Manager dashboard. There are several items on this screen that are worth paying attention to. Figure A: This is the Server Manager dashboard. The first thing that you will probably notice is the big, orange section near the center of the screen. This section is designed to help you to quickly get the server configured. As you can see in the figure, this section contains links that you can click to add roles and features, add other servers to manage, or to create server groups. As you have seen throughout this series, all of these tasks can be performed manually, but if you forget how to do so then you can simply click on one of these links to get the ball rolling. The next thing that I want to point out is the column on the left. This column lists a number of different Server Manager views. At the moment the Dashboard view is selected, but you can switch to a different view by clicking on the view. Some of the views that are listed are standard for Windows Server 2012. The Dashboard, Local Server, All Servers, and File and Storage Services views are created by default. There are also views that may exist as a result of the way that you have configured your server. For example, in the figure above the AD DS, DNS, and Hyper-V views exist as a direct result of installing the corresponding roles and features. The bottom two items on the list are Lab Servers and Production Servers. These are actually computer groups that I manually created at an earlier time. I want to delve into views a little bit more, and talk about how the views relate to the roles and features that are installed. Before I do that though, take a look at the lower portion of the screen capture shown in Figure A. This section contains a series of boxes for the roles and server groups that exist on the server. As you can see in the figure, each box corresponds to a specific role or server group. The boxes are color coded. Boxes display green to indicate that there are no issues related to the particular role or server group. Conversely, the red boxes indicate that there are issues that need to be addressed. These boxes are designed to help make it easy for you to resolve the issues that have been detected. If you look back at the figure, you will notice that each of the red boxes contains a number just to the right of the box name. This number reflects the number of issues that need to be resolved. If you look beneath each box’s header, you will see a series of categories listed (Manageability, Events, Services, Performance, BPA Results). A red flag to the left of a category indicates that there are issues related to that category that need to be resolved. For example, in the screen capture the Lab Servers server group has two manageability and one service related issue that need to be addressed. Before I show you how to examine these issues, I need to quickly clarify one thing. The Server Manager has a way of making these issues seem critical because of the way that the issues are displayed in red. In most cases however, you will likely find that the issues that have been detected are anything but critical. To attempt to resolve an issue, simply click on the issue category. This causes Windows to display a detail view. 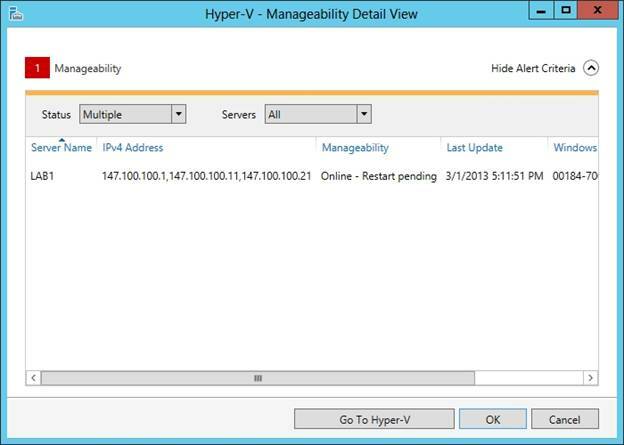 For example, when I click Manageability under Hyper-V, Windows displays the screen shown in Figure B. Figure B: This screen was displayed when I clicked the Manageability container in the Hyper-V box. As you can see in the figure above, the dialog box identifies the source of the problem. In this case the server needs to be restarted. There is however, one more important piece of information displayed in this dialog box that might not be readily apparent from the screen capture. If you look closely at the alert that is being displayed, you will notice that the server name and the server’s IP address are both listed as a part of the alert. The reason why I bring this up is because in the screen capture above the alert that is displayed actually pertains to a remote server that is not even powered on at the moment. Therefore, when you see alert message is displayed in the Server Manager dashboard, you cannot automatically assume that the alerts are for the local server. Often times, the alerts pertain to remote machines instead. Obviously, correcting this alert would have been as easy as turning on the server that is mentioned and then allowing it to reboot. What if the problem had been more serious though? If the problem had been more serious than the alert should have at least given a hint as to the cause of the problem. The dialog box also contains a Go To Hyper-V button that could be used to open the interface that is needed to correct the problem (in this case the Hyper-V view). Now that I have shown you how the alert boxes work, I want to go back and talk a little bit more about the views that I mentioned earlier. As previously mentioned, many of the views are specifically related to roles or features that have been installed on the server. When you click on a role or feature related view, Server Manager displays a number of pieces of information related to that view. You can see an example of this in Figure C.
Figure C: Selecting the Hyper-V view causes Server Manager to display information related to Hyper-V.
As you can see in the figure above, selecting the Hyper-V view causes Windows to display the Hyper-V servers, and events and services related to Hyper-V. 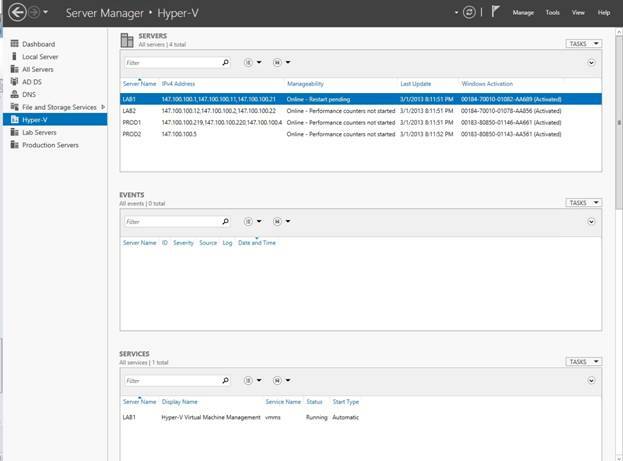 If you were to scroll down, you would find the Best Practices Analyzer, the Performance Monitor, and information about the Hyper-V role. All of these tools can be accessed in other places throughout the operating system, but Server Manager puts them all together in one place for you. Throughout this article series, I have discussed some of the most common management and configuration tasks that you will have to perform when you are first getting a Windows 2012 server up and running. As you can see, the general configuration process for Windows Server 2012 really isn’t all that different from earlier versions of Windows Server. It is simply the new user interface that takes some getting used to.